With US commercial operations utilizing nearly 40% of domestic electrical consumption, controlling business overhead with onsite energy production is financial win-win for your business as well as for the planet. Those solar panels on your roof are a billboard announcing to the world that your company understands the importance of economic and ecologic sustainability. Plus a percentage of your customers will love you all the more because you care! In the daily business battle for hearts and minds, it is always better to be perceived as the good guy in it for the long haul rather than the pirate ripping out short term gains and damn the consequences. All well and good. But how do the solar numbers work out in the real world? Current Vermont rules encourage roof mounted systems, a response to the proliferation of large ground systems in prominent view from our scenic highways. We also had to agree to use at least 50% of what we produce in the building that hosts the installation; not an issue in our case. There are many different financing schemes available to go solar. The simplest way is buy into an existing or proposed system. By buying or leasing panels (a percentage of output) on a large commercial installation a company can garner a 10% to 20% savings on their electric bills. This scheme works very well with hydropower or wind too. Putting up your own panels can save you even more over 20 -25 years. Plus – and this is a big plus – if you have a permit in hand in 2018 you can save 30% of the total cost of system through a Federal Tax Rebate. The first bid came in at $550,000. This seemed high, and it was. Questioning the economics of the investment at that price we continued the process. The next bid came in at $275,000. This seemed crazy low. Further investigation showed us why. This company wanted to use inverters that had a likely 8 year useful life at the amperage we would generate rather than 25 years or more from a better quality bank of inverters. (Note: Inverters turn DC solar panel power into more useful AC power.) The panels were super cheap and we are pretty sure that they were returns from a massive recall of potentially defective panels. The middle bid came in at $475,000. Better, but not what we had hoped for. By negotiating down the maintenance contract we settled on a figure closer to $425,000. Needless to say these are the contractors that got our business. We got a quality system installed by quality people that should outlast the 25 year stated life of the unit. Shout out to Suncommon for their help and patience and professional staff! Key Bank offered us 100% financing on the system. Basically, they get the first 10 years of power the system produces. After that we own it and whatever power it makes for the next 15 years. After that we expect another 5-10 years of lower production numbers as the panels and inverters age and become less efficient. Since we own the panels we get the tax incentives. The 30% Federal Tax incentive is worth $127,000. Plus we take the interest and depreciation schedule. Adding it all up we are looking at $1M in income on a roughly $500,000 investment (with estimated interest charges) over 20 years. That’s an estimated $25,000 in yearly income and tax savings over 20 years for a no money down investment. Not too shabby! Every deal is a little different and incentives and PSB guidelines can change year to year, so if you are looking at installing solar for your business get going now or lose the 30% tax credit which phases out year’s end. This is the Soapman letting you know that your next bar of organic Vermont Soap might just be made with solar power! Most Vermont Soap products are certified to USDA organic food standards. Click here to see our organic certificate. 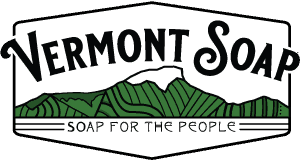 Visit with Vermont Soap at Supply Side East 2019! Which Toothsalt Product Should I Use? Three dermatologists, 3 different diagnoses. What do you recommend? What is my lemongrass bath gel preserved with? What do you recommend for dishwasher soap or laundry? Sign up for our eSpecials and get a FREE gift with your next order. We will email you special offers, contests and new product introductions once a week that can save you up to 50% off list! Thank you for your support and for your interest in nontoxic products.